As is customary in our blogging community we like to point out our favorite blogs and share the love of all things blog. I, however, am very slow at most things I do. I have an award from February. At least it’s this year! From BridgesBurning. Bless her heart she thinks I am sparkly enough for the Mrs. Sparkly Ten Commandments. Chris, my apologies for being such a slacker. But, I am to answer questions and send this on to ten more bloggers. 1. Describe yourself in seven words: active, appreciative, grateful, giving, accepting, tolerant, mischievious. 2. What keeps you up at night? anxiety about bad things happening to people I love. 3. Whom would you like to be? well, seeing as how everyone else is taken, I guess I’ll settle for wishing I could be better at being a better version of me. Was that a redundant use of the word “better”? 4. What are you wearing now? bike shorts and dry fit work out shirt. You may assume I am wearing appropriate things underneath. 6. What are the best and worst things about blogging? the best thing is all of the incredible reading material out there that not everyone has quite learned the value of yet. The worst part, is the fear of not being valued. 7. What was the last website you looked at? 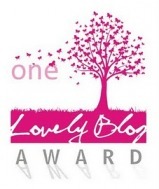 The bloggers who nominated me: BridgesBurning and Photography + Science + Chanel (though this will be 2 different awards). 8. If you could change one thing about yourself what would it be? I wish I did more for my community. Something I can change, and don’t need a wish to achieve. 9. Slankets, yes or no? No. A blanket is a blanket. A shirt is a shirt. The two are not the same. I’m too traditional. 10. Tell us something about the person who tagged you. The best thing I can say about Chris, is that because of what I read of her writing, I truly want to meet her. And I want her as my friend. Her genuine-ness and charm make me want to drive on up to Canada and meet her at a Tim Horton’s so she and I can meet, and include her in my life. Now to my next 2 awards given by the same person on the same day. A twofer! From Chanel at Photo+Science=Chanel. Okay then, the check off list. 2. Seven things about me. Lordy you need to read my blog. I am trying to stay healthy as possible for as long as possible so I am currently on a green smoothie kick. Love it! This will likely be a life long adventure (1 and 2). I stopped drinking my beloved Diet Coke but for maybe once weekly, as part of my healthy changes (3). I still eat dark chocolate because I want to (4). I love love love humor but am not good at creating it (5). I hate dresses, always have, always will (6). I would rather ride my bike than drive but sadly have to drive more than I get to ride (7). You probably knew some of that anyway. Somebody’s blog that I can’t post because it’s a secret but I love it. You know who you are. I love to read an eclectic mix of things. If I haven’t included you please don’t be offended! I would have loved to added more but I have to go to sleep! Blogging doesn’t pay the bills. The day job does. Thank you everyone who reads. Thank you everyone who writes, and shares their talents so freely.